A file photo taken on April 25, 2017 shows a US officer from the US-led coalition, speaking with a fighter from the Kurdish People's Protection Units (YPG) at the site of Turkish airstrikes near northeastern Syrian Kurdish town of Derik. Syrian Kurdish allies of the United States reacted with alarm to Wednesday's surprise announcement by President Donald Trump on Twitter that all American forces have begun withdrawing from Syria. A rapid withdrawal, they say, will leave them vulnerable to an offensive Turkey has threatened to launch against them east of the Euphrates river — and would likely lead to a peeling away of Arab fighters aligned with them who are being courted by Syrian leader Bashar al-Assad. The Kurdish-led Syrian Democratic Forces said in a statement Thursday that a U.S. pullout would have a negative effect on the fight against Islamic State militants and could allow the group to rebuild itself. Russia welcomed the announcement Wednesday, saying the decision creates opportunities for a political solution to the crisis there. The Trump administration has not detailed any withdrawal plan, or explained how the United States will remain engaged in the conflict after its troops leave. But it could have immediate consequences for the tense relations between Kurdish and Turkish troops in the region. 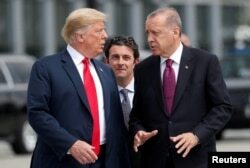 FILE - U.S. President Donald Trump and Turkish President Recep Tayyip Erdogan converse at the start of a NATO summit in Brussels, Belgium, July 11, 2018. On Monday, Turkish President Recep Tayyip Erdogan said he was ready to launch a new cross-border military operation at any moment against the Kurdish Peoples' Protection Units, or YPG, which have been shielded from Turkey by the U.S. military presence. Speaking at a rally earlier this week, the Turkish leader claimed he had won concessions from Washington during a lengthy phone conversation with Trump about a new offensive against the U.S.-allied YPG. Ankara sees the YPG as an affiliate of Kurdish militants in Turkey. Earlier on Wednesday at a regular press briefing, Russian foreign ministry spokeswoman Maria Zakharova called the U.S. military presence in northern Syria "illegal" and said it was an obstacle to finding a political solution to the Syria conflict. "From being a factor in the fight against terrorism, the illegal American presence in Syria is becoming a dangerous obstacle to the path to a settlement," she was quoted by Russian media outlets as saying. Hours later, the Wall Street Journal first reported the U.S. leader was weighing whether to order an immediate withdrawal of about 2,000 U.S. soldiers stationed in northern Syria, where they have been fighting jointly with the Syrian Kurds against the Islamic State group as part of an international anti-terror coalition that includes European powers Britain and France. Kurdish commanders in northern Syria say they still hold out hopes that the U.S. president might reverse his decision. "We are being told that the Pentagon is pushing back — which is why we are being careful in what we are saying now," said one YPG commander. "But if there isn't change of heart, this will be green-light for Turkey to attack," he added. British officials say although they had been readied by Washington for a possible Syria-related announcement but that Trump's tweet took them by surprise. Tobias Ellwood, a defense minister said he "strongly disagrees" with Trump's assessment of IS's defeat. He said the terror group "has morphed into other forms of extremism and the threat is very much alive." British officials say they have no immediate plans to follow suit to withdraw from the conflict — a position echoed by French officials. French president Emmanuel Macron believed he had only recently convinced Trump to keep U.S. troops in Syria as a bulwark against any possible IS resurgence. He pointed to a United Nations report in August that estimated IS still had up to 30,000 fighters in Iraq and Syria. European officials say they had been lulled by remarks made by just a few days ago by Brett McGurk, Trump's special presidential envoy for the global coalition to defeat IS, who said: "Nobody is saying that [IS fighters] are going to disappear. Nobody is that naive. So we want to stay on the ground and make sure that stability can be maintained in these areas." Syrian Kurdish commanders say they had been given assurances by their American partners of a continued U.S. military presence — at least until IS couldn't mount any kind of resurgence and there is greater stability in northern Syria. U.S. forces have been maintaining patrols around potential flash-points between Turkish and YPG units close to the town of Manbij and along the Syria-Turkey border to deter any clashes. File photo taken on May 8, 2018, shows vehicles and structures of the US-backed coalition forces in the northern Syrian town of Manbij. Trump's tweet triggered strong criticism from several U.S. analysts who are focused on the long-running Syria conflict, who say that an American withdrawal from Syria risks allowing IS the opportunity to re-group and will strengthen Assad. "The Trump administration's repeatedly stated primary goal in Syria has been the enduring defeat of ISIS," says Charles Lister, an analyst at the Middle East Institute, a Washington-based think tank. "We're arguably years from achieving that. To make that fact as clear as day, ISIS claimed responsibility for an attack in Raqqa only 10 minutes before Trump's mission-accomplished tweet. That's a city the U.S. liberated and in which U.S. troops and USAID and State personnel are deployed in to this day," he said. Lister added: "Geopolitically, this is not just a dream scenario for ISIS, but also for Russia, Iran and the Assad regime, all of whom stand to benefit substantially from a U.S. withdrawal from Syria." Richard Haass, president of the Council on Foreign Relations and a former U.S. ambassador, tweeted in response to Trump's: "One can only hope any U.S. military withdrawal from Syria would not be unconditional. It would be strategically and morally wrong to leave Syrian Kurds to their fate vs Turkey. Same holds for leaving Syrian people to face their government, Iran, and Russia."